The festivities, held at the RCSC New Delhi, commenced with an exhibition by renowned Russian photographer Alexei Sukhopar and continued with a performance by ballroom dance ensemble Rhythm. A festive program, launching the Indian celebrations of the 'Year of Culture in Russia – 2014,' was held on February 3 at the Russian Centre of Science and Culture (RCSC) in New Delhi. The program commenced with an exhibition by renowned Russian photographer Alexei Sukhopar, titled Karelia Today, and continued with a performance by ballroom dance ensemble Rhythm (from Petrozavodsk). The audience at the RCSC included prominent Indian politicians, journalists, artists, diplomats and other residents of the Indian capital. The chief guest was Russian Ambassador to India Alexander Kadakin. The evening was dedicated not just to the Year of Culture, but also to the Sochi Olympics, which start this week, and Diplomats’ Day. The performance of the Rhythm was met with a generous round of applause. 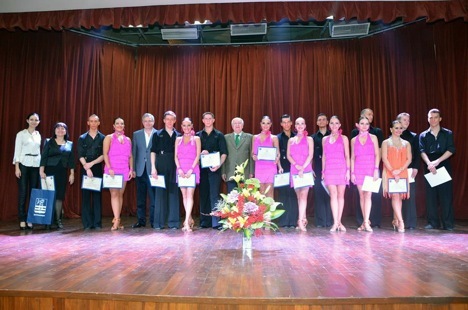 The young men and women performed a full gamut of dance styles: from classical waltz to samba, displaying their skills to the sounds of "Rumba" by Filipp Kirkorov and a Spanish suite. Rhythm’s rendition of an Indian-style dance to Indian music was particularly appreciated by the audience. The guests at the RCSC also saw presentations about the Russian region of Karelia, its nature and potential. “Today we have witnessed a ​​fine ensemble with an excellent program of brilliantly staged dances,” Alexander Kadakin told RIA Novosti. “It was essentially sports dancing, but conveyed the flavour of our country. It is also important because the cultural centre today is opening a series of events devoted to the Year of Russian Culture, on top of which today's gathering is dedicated to Diplomats’ Day, which will take place on February 10. And, of course, everyone’s attention and television will be tuned into the Olympic Games in Sochi,” the Russian Ambassador added. Mehta added that the word Karelia is very similar to the word Kerala. “If no one knew where the photographs at this exhibition had been taken, people would think they were from India’s Kerala. They have the same blue water, sky, and coastline,” remarked Mehta. Sukhopar also spoke about the launch of the “Kerala-Karelia” project. “It has been ongoing now for a year — in Russia we’ve been collecting information about Karelia and exhibiting it in Kerala, and then taking photos of Kerala and organizing exhibitions back in Russia. We are trying to find a common basis for Russian and Indian culture. They are made up of different elements, but have a common framework and sometimes the similarities are so astounding you have to ask yourself: Am I in India or Russia?” Sukhopar said. The photographer is not trying to define his style.“It’s just that when I arrive somewhere, I try to soak up the atmosphere of the place, and it’s this atmosphere that allows me to realize my conceptions,” Sukhopar said. By decree of Russian President Vladimir Putin, 2014 has been declared the Year of Culture.